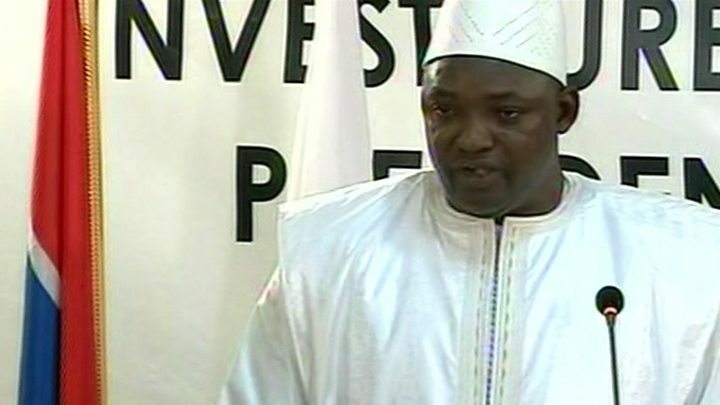 Senegalese troops have entered The Gambia in support of Adama Barrow, who was sworn in as president on Thursday after winning last month's election. Mr Barrow took the oath of office at the Gambian embassy in Senegal's capital, Dakar, and his legitimacy has been recognised internationally. The West African regional bloc Ecowas has now given Yahya Jammeh until noon on Friday to leave office. Ecowas has threatened to remove Mr Jammeh by force. The 15-member UN Security Council has given them its backing, while stressing that a political solution should be attempted first. Mr Jammeh's refusal to leave office is supported by Gambia's parliament. New mediation talks ahead of Friday's deadline will be led by Guinea's President Alpha Conde, after talks between Mr Jammeh and Mauritanian President Mohamed Ould Abdel Aziz failed to break the deadlock late on Thursday. Mr Barrow, who remains in Senegal, has said that he will not return to Gambia's capital, Banjul, until the military operation comes to an end. Nigeria deployed reconnaissance aircraft over The Gambia on Thursday as part of the mission, warning that it was ready to strike militarily. The tiny country, a popular destination for European holidaymakers attracted by its beaches, has been clouded by uncertainty for weeks. Thousands of Gambians have sought refuge in Senegal while tourists broke off their holidays to return home. Few people have come out to celebrate, timidly chanting the name of Mr Barrow or waving at the cars driving by. Tension is still running high, as people are very much aware that the political crisis is not over. Banjul feels like a ghost town. Even the usually busy thoroughfares of Serekunda, on the outskirt of the capital, are deserted. Many say the military remain - like Yayha Jammeh - unpredictable. But in a sign that parts of the security forces may switch sides, I have met five police officers standing outside their station, relaxed and visibly happy. I asked how things were going, and one of them replied with a smile "everything is alright, change is good". A convoy of heavily armed Senegalese soldiers, in full battle dress, could be seen heading for the Gambian border. They are backed by Nigerian air and naval power, as well as other troops from Ghana. A Senegalese army spokesman, Col Abdou Ndiaye, told the BBC that the troops had encountered no resistance and were heading for Banjul. He warned: "It is already war. If we find any resistance, we will fight it. If there are people who are fighting for the former president, we will fight them. The main goal is to restore democracy and to allow the new elected president to take over." But Gambian army chief Ousman Badjie said his troops would not fight Senegalese forces because the dispute was "political". "I am not going to involve my soldiers in a stupid fight," he said. "I love my men." In his inaugural speech, President Barrow ordered all members of The Gambia's armed forces to remain in their barracks. Any found found illegally bearing arms would be considered "rebels", he said. How great is the pressure to remove him? The Economic Community of West African States (Ecowas) mandated Senegal to take the lead in outside intervention because it almost surrounds The Gambia. The Ecowas strategy was approved by the UN Security Council which unanimously approved a resolution expressing "full support" for President Barrow and calling on Mr Jammeh to step down. "I think events will move quickly now," Alex Vines, head of the Africa programme at Chatham House in London, told the Associated Press. "Jammeh will not last 90 days remaining in power. He may cling on to power for a few more days, increasingly isolated. After the inauguration of Adama Barrow, the trickle of power flowing to him will become more of a flood."